In a Hurry? Need the Best Indoor Electric Grill fast? If you’re looking for the best indoor electric grill, this one does it all. This Cuisinart GR-4N grill looks great with its brushed stainless steel appearance. It also grills a steak perfectly. It’s actually a 5-in-1 appliance. You can grill, griddle, use as a sandwich press and use with the top closed down for two cooking surfaces functioning at the same time. You can also open it up and double the size of the grilling or griddling surface. You can even grill on one side and griddle on the other at the same time. This is a very versatile appliance. The grilling and griddling plates have a non-stick, BPA-free, surface. They’re dishwasher safe too. Each grilling surface is 9 inches x 11 inches. So if you open the grill up flat you’ll have double, that is, 18 inches x 11 inches of grilling space. Does it get hot enough to sear a steak? The maximum temperature is 425 degrees. And it heats up quite quickly so you can get your steak on quickly. If you’re using the grill to cook top and bottom at the same time you can easily fit a 2 inch steak between the plates. It adjusts to the thickness of the food. It’s great being able to experiment with using the top plate to grill or open up the grill to be totally flat and use one side for grilling steak and the other to do more delicate vegetables on the griddle. You can also grill burgers really easily with the double plates. It grills quickly and in a healthy way because the excess grease drains away. This is the most convenient indoor electric grill I’ve used because it also saves space in the kitchen by being 5-in-1. I like having the option to grill or griddle using the same appliance. I can cook pancakes on the griddle for breakfast (or bacon and eggs or French toast). Then I make a panini for lunch on the griddle. And in the evening we can grill a steak or chicken breast with vegetables. Such a great kitchen appliance. So handy. Because it is so versatile I don’t have to make a big mess in the kitchen with different pans to grill and griddle different foods. It is a huge advantage to be able to grill on one side and griddle on the other side contemporaneously. There is a drip tray attached underneath this indoor electric grill. It is easy to remove and clean. This really is the best indoor electric grill for so many reasons. It will sear steak at a high temperature with perfect grill marks. You can toast panini, cook pancakes, make bacon and eggs and grill vegetables while using the griddle for other more delicate vegetables. You’ll love this grill from the first moment you receive it. ==>> Need more ideas for Father’s Day? See them here. This indoor electric grill is perfect for chicken and fish. It provides good even heat distribution because the heating element is in the grill plate itself. The grill plate is non-stick and easy to clean. The grill plate is removable. But it’s not dishwasher safe because of the electrical socket attached. You can wash it by hand in the sink as long as the electrical socket doesn’t get into the water. Don’t be discouraged by this because most people love this grill and recommend it as being easy to clean. If you need an indoor electrical grill with a grill plate that goes in the dishwasher see this grill, Click Here. Can I use it to keep food warm? The Delonghi BG24 Perfecto electric indoor grill includes a lid if you need to keep food warm. There’s also a drip pan which is removable and non-stick. The drip pan is dishwasher safe for easy cleaning. Not only is this indoor grill great for chicken and fish but it also grills a great steak and vegetables. If you’re concerned about cleaning the drip pan you can put water in it. The water also means less smoke when grilling and it helps to keep food moist. This is the best indoor electric grill if you want high quality at an affordable price. You’ll get great results with chicken and fish. Just one word of warning…these types of grill are intended for food to be mostly flat for even cooking. I wouldn’t count on cooking a whole chicken on this grill. The food should be flatter, to cook through evenly. This grill plate has very good even heat distribution and is great for ensuring your chicken gets even heat when cooking. If the food is not flat, you may need to use a meat thermometer to ensure your meat has cooked at a high enough temperature in the middle, making it safe to eat. This is nothing new, it’s the same with any grill, whether it be indoor or outdoor, so just remember it is different from cooking in an oven where the heat is contained. This is the best indoor electric grill for fish and chicken because of its even heat distribution. With a little water in the bottom pan you’ll enjoy tender chicken and fish on your Delonghi BG24 Perfecto electric indoor grill. This grill gives you delicious food every time. ==>> Looking for a sports gift for Dad? See more Father’s Day ideas here. The Presto 09020 indoor electric grill is great for grilling a steak and probably the easiest grill to clean. The non-stick grill plate is removable and dishwasher safe. Or you can wash it in the sink if you run out of room in your dishwasher after the dinner plates go in. It heats up quickly to a maximum of 400 degrees for searing. It gives a good even temperature across the plate for grilling. The cooking surface is 16 inch x 10.5 inch. This indoor electric grill does not come with a lid but this is usually not a problem. You don’t often want to use a lid when you’re grilling because it will end up steaming the food instead. Are there gaps for food to fall through? This grill works really well for thin vegetables like asparagus because there are no gaps for food to fall through. It’s good for shrimp too, for the same reason. The Presto 09020 indoor electric grill is great value. Its price is low but it grills perfectly. If you’re looking for great value in an easy to clean indoor electric grill then this is the one for you. It would also make a great gift for someone moving into an apartment who isn’t allowed to use charcoal or propane to grill on their balcony. This easy to clean grill can be placed on a table outside or the counter in your kitchen. Since the grill plate is removable it’s easy to carry to the dishwasher or sink to clean. As I mentioned, this product is very good value. This is the best indoor electric grill, not only because it is easy to clean but also because it gives you the best bang for your buck. If you’re only thinking about an indoor electric grill for the first time you might even want to try this model first without committing too much money to it. Even if you grill several times a week, I think you’ll be happy with this lower priced Presto 09020 indoor electric grill. Is your Dad clever in the kitchen? See the best Sous Vide Machines here. Great as a gift. The Elite Gournet EMG-980B electric grill gives you smokeless grilling under normal conditions. Most people report no smoke at all from their grilling on this appliance. Obviously there is a little steam, just as there is from cooking any food. But overall this is the best indoor electric grill for being smokeless. It’s great for grilling indoors in cooler months. It’s also perfect for people living in apartments. The grilling plate is a round-shaped 14 inch plate. It’s big enough to easily feed a family of four for dinner. The maximum temperature is 400 degrees. The grilling plate is removable for easy cleaning but it’s not dishwasher safe. There is a hole in the grilling plate where the oil and grease drains out, into the drip tray. The drip tray is removable and can be cleaned in the dishwasher. This is the best indoor electric grill for steak, chicken, salmon, vegetables and other foods without smoke. This model includes a tempered glass vented lid. 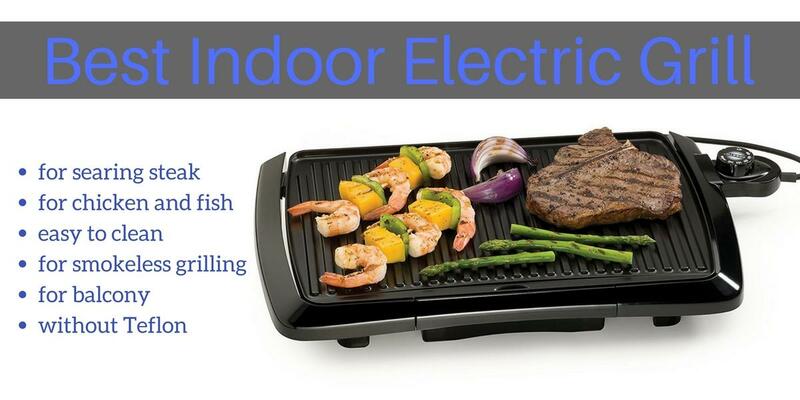 You can easily move this indoor electric grill around because it is light. Is the drip tray large enough? It’s easy to use and clean up. But the drip tray may be a little small for the large size of the grilling surface. If you are concerned about this you may need to look at another model. I usually grill lean pieces of meat so I don’t have any problem with it. There are no gaps in the grilling plate for food to fall through so it’s easy to use and easy to clean. Food like shrimps or asparagus don’t have any gaps to fall through. The grilling plate is non-stick. However, I have heard of some people covering the grill plate with foil so there is no clean up at all. Personally, I think this defeats the purpose of using a grill for healthy benefits. If you wrap the grill plate it won’t drain the excess grease and oil from your food. Although I would be happy to use this foil technique occasionally. You can also use foil to wrap the food itself. For example you can wrap a piece of chicken before grilling to get a really tender result. Again, this doesn’t allow the grease to drain off, but that may not be important, depending on what you’re cooking. If you want smokeless grilling indoors, this is definitely the best indoor electric grill. You’ll enjoy delicious grilled food when it’s cold outside and you want to grill in your kitchen. This is a large electric grill which can cook 15 burgers at once. With the stand included, it is so convenient for using on a balcony. But you can also remove the stand and take the grill inside to use in your kitchen. The power cord is removable so if you keep the grill on your balcony you can take the electrical cord inside when not in use. The surface of the grill plate is a non-stick surface and easy to wipe over to clean. The plate is not dishwasher safe and you cannot submerge it in water for washing but most people find it quite easy to clean. There’s a drip tray included under the grill plate. The unique slope on the George Foreman grills allows extra grease and fat to drain away from your food as it cooks. What food can I grill? This indoor outdoor electric grill can be used to cook steak, chicken, fish, pork, burgers, kabobs, appetizers, vegetables and almost anything else you would want to grill. Obviously it is designed for the food to be relatively flat to cook properly and evenly. If you live in an apartment with a policy on no charcoal and no propane then you’ll love this electric grill. In fact, even if you don’t have any restrictions placed on you, you’ll still love this grill. It is so easy to use and clean. It’s a good size to feed the family and there are no risky flare-ups from a flame. It is entirely electric. If you’re looking for the best indoor electric grill that can also be used outdoors, the George Foreman GFO240S is perfect. Use it on your balcony in fine weather or in your kitchen when the weather turns cold. You’ll enjoy many grilled meals on this one. The Oster CKSTGR3007-ECO has a reversible grill plate which can be used as a griddle if you turn it over. The plate is coated with a durable ceramic surface. It is PFOA and PTFE free. It’s a natural ceramic coating which heats up to 20% faster to save time and energy. The ceramic coating helps with heat dispersion so you don’t get any cool spots on your grill plate. It produces good even heat right across the grill. I really love this grill. It’s a pleasure to use. There are no worries about scratching a non-stick teflon surface and the option of two different grill plate surfaces really suits my cooking. I use the griddle for breakfast and the grill for dinner. Oster also states that the ceramic coating will last up to 4 times longer than standard non-stick coatings without flaking or peeling. The grill plate is removable and dishwasher safe so it’s easy to clean. The grill plate features a 10 inch x 18 inch surface making it big enough to grill for the whole family. Is the heat high enough to sear? The temperature goes up to a maximum of 450 degrees so you can sear steak or salmon easily. The griddle side of the plate is handy for making breakfast. It’s great for cooking pancakes, eggs or French toast. For lunch you can fit six grilled cheese sandwiches on the griddle. The grill plate drains grease and fat off to a drip tray underneath for healthy cooking. If you’re concerned about Teflon coatings, this Oster CKSTGR3007-ECO indoor electric grill is perfect for you. With its natural ceramic coating you still get non-stick properties without the PFOA or PTFE chemicals. This indoor grill is a good performer, giving tasty grilled meat with its high temperature. I really like the option of being able to use the griddle side of the grill plate. It lets you cook eggs and other foods for breakfast without getting multiple pans out of the cupboard. If can fit more food than a skillet and it’s easier clean up. Even if you’re not looking for a Teflon-free grill, you might choose this as the best indoor electric grill because of its 2-in-1 capabilities. Getting a grill and griddle in one appliance saves you space in the kitchen and money. This is a high quality indoor grill and perfect for cold months when you can’t get outside to grill. You can enjoy healthy cooking with this ceramic coated grill plate while still achieving the classic grill marks on your food. This indoor electric grill will give you great flavor and a healthier meal option.